Church in Wymoning Quiets Sanctuary. While the Anc-3000 Wall panel is our standard noise absorption panel, it’s a perfect retrofit for virtually any application that is not in the path of high abuse areas. The rigid fiberglass fabric wrapped panel can be use aesthetically to absorb sound and significantly reduce and shorten the echo in rooms with substantial volume. Besides the selection of Guilford of Main colors, designer and customer specified fabrics are available for ordering. 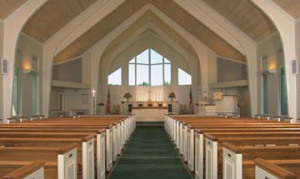 All Noise Control provided St. Mark’s Episcopal Church with a solution of angle cut ANC-3000 1″ acoustical wall panels. In the heart if Texas, Milan middle school had a noise reverberation problem typical to institution spaces such as gyms, cafeterias, auditorium and general purpose rooms. We all associate the echoes, noise and reverberation of sound with gyms, pool areas & large auditorium / multipurpose rooms and certainly can relate to the high noise levels in these types of rooms. In this middle school gymnasium (a problem in virtual all gymnasiums), the sound bounces off the walls more than the basketballs. Due to the volume and space in these rooms and lack of noise absorbents, the noise grows and creates echoes and reverberation seriously impeding speech intelligibility. When the gym was in use, the conversation next to you was indistinguishable from the conversation across the floor. Theta Pro2Serve Management Company Contacted All Noise Control to provide them with ceiling tiles for their existing drop in ceilings. After receiving the sizes and dimensions, All Noise Control provided a solution using ANC-1010 1 this Fiberglass ceiling tiles 2mil. White pebble grain facing. Central Christian church reached out to All Noise Control to correct the echo problem in the sanctuary of the church. All Noise Control suggested ANC-3000 wall panels. Wall panels are composed of a high density fiberglass core, wrapped in Guilford of Maine fabric which is available in 48 colors. ANC wall panels provide an excellent acoustical solution with NRC ratings from .85 to .95. Houses of Worship acoustics require special attention and knowledge to the nuances of voluminous spaces, hard surfaces, especially in the new architectural designs of today’s buildings. This excessive space is wonderfully impressive but allows for significant reverberation, which we are familiar with as echoes. Reverberation can reduce speech legibility and can make otherwise good church sound systems sound awkward. Imagine your ear being bombarded with an array of sounds at different decibels repeatedly served in waves. These sound waves maintain a surprising amount of energy and continue on absorbing and interfering with other sound waves.